About 20 years ago, if I ever heard that someone was a recruiter, I would have instantly assumed they were trying to fill battalions with enlisted or coerced men to march off to some foreign land to represent their country on fields of battle. I had never heard of “recruitment” as an industry or profession that filled job openings at places of business. It just wasn’t part of my vocabulary or understanding. I was a child of the 80s, what do you want? I had no idea, that is, until I became a recruiter — I enjoyed filling open positions and helping job seekers find employment. I love this profession, and now many years later (too many to count or say), I am hopelessly devoted. I love the recruiting industry and am passionate about jobs, HR, and opportunity. Last Spring, I was given the opportunity to serve as a judge on a hot new web-based reality show called “Top Recruiter — The Competition.” I created a challenge for recruiters, worked through it with the producers, and then delivered it to the competitors on camera with the desire to share all the ins and outs of the recruiting industry and assist a wanting public of job seekers. The hope is that job seekers will gain an understanding of the recruiting process and that recruiters will reclaim pride in what they do. While unemployment sits harshly at 7.9 percent in the US, we need all the help we can get. While the United States and other countries experience ongoing high unemployment rates and battle deflated egos and a prevalent, “I Give Up” syndrome among the unemployed, this lovely little show came along at just the right time. 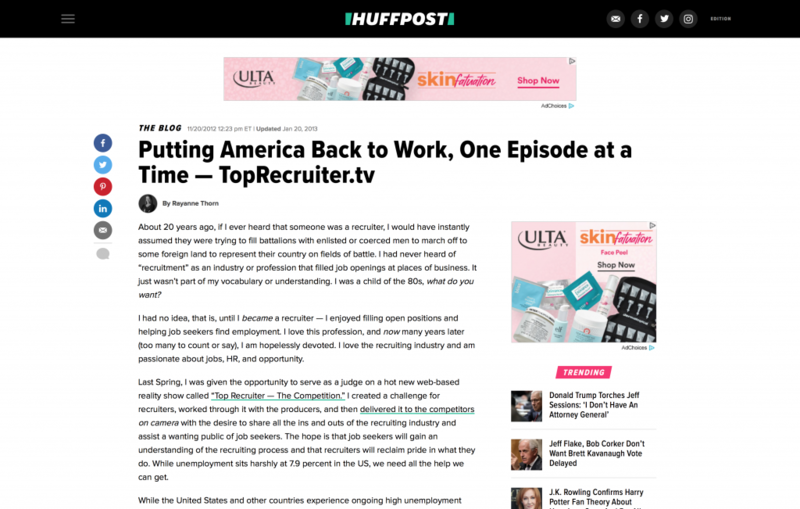 Not only is it filled with intrigue and drama — the likes that every reality show craves — it is also filled with ideas which benefit both sides of the jobs market — those looking for employment and those offering employment. Top Recruiter’s Executive Producer, Christopher Lavoie, had an idea that maybe the time was right, that maybe it was time to dive in behind the hiring process and give job seekers a backstage pass to what happens in the life and mind of a recruiter or hiring manager and also share some job search advice. This gives the job seeker a “one-up” – maybe he will benefit from the information share and re-formulate his or her own job search process to increase the benefit. In a society where there is so much take, it is nice to see a little share and free education. Paying it forward always pays off. Thanks TopRecruiter! Good news travels quickly, as CBS Miami shares more of the story about the ten-episode web series shot in Miami, one of the hardest hit cities in the US affected by high unemployment and a struggling economy. Lavoie now eyes Season 2 with filming taking place in the Magic City of Miami once more. This is an exciting time for our country — we stand at the brink of returned greatness. I am happy to be part of a continuous movement to put America back to work — it’s time!